Archive for the ‘Home Theater’ Category. We have a TV on the wall of our patio. We don't use it that often, but in fall evenings it is sometimes fun to sit outside and watch the baseball playoffs. Also, that is the only TV we ever allowed a game system so we could always see our kids playing. The TV is under a covered area but close enough to the outside that rain will sometimes blow in and get it wet. It gets really hot a lot, over 115F in the summer. It is constantly subject to dust storms in the monsoon seasons. For a while we considered an special all-weather TV like this one. If the TV had been completely out in the open, we probably would have bought one. But instead we bought a regular LCD TV -- just something from Samsung I think -- on sale at Amazon. The regular TV was 1/3 the price, and we figured that even if it died, we would still be ahead having bought two instead of one of the more expensive TVs. The TV has now been out there for over 5 years and is doing fine. If you want a TV outside, unless it is directly in the elements, I have found that regular TV's are pretty durable. I was looking for a 4-channel amp to drive a pair of bipole speakers. For fun, I decided to try to build one. I bought a broken amp off eBay just for the case for about $30. In retrospect, I probably should have bought an inexpensive blank case they sell to hobbyists. At the time, I was intimidated by drilling and tapping a lot of holes in a metal case. Since then, I have found this to be easy, easier in fact that ripping all the guts out of the old amp. 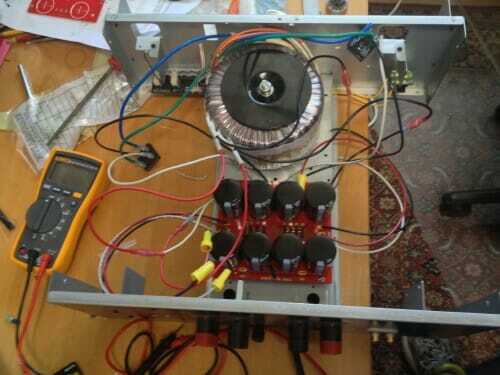 Anyway, I finished the power supply. The big fat over-sized torroid delivers 35 volts AC to the diode bridges and the smoothing capacitors on the back end, which in turn delivers about 48.5 volts DC for my amp (this measured dead-on the expected 35*sqrt(2)-1 one would expect). I tried to save some of the old amp's 110V circuitry (such as some filter capacitors). It had a relay with some sort of delay circuit in parallel with a big resistor as a soft-start mechanism, to prevent a big inrush current. I could never make it work right, so I replaced it with the poor man's alternative, which is a couple of thermistors that have high resistance cold but quickly heat up and lose their resistance when the power is on. The capacitors and RC network are in an absolutely beautiful empty board I bought from someone on eBay who etched boards for First Watt kits (an amp series that the designer has generally put into the public domain). I cribbed the power supply off the design for an F5 amp, though I had to adjust wattage and voltage values to match the voltage I needed. I spent a week dithering on what capacitors to use -- audiophiles go on an on about capacitors. Finally, though I am sure all these folks will swear to God they can hear the difference between two brands of capacitor in the power supply, I finally decided I probably would not notice and bought some well-regarded but reasonably priced ones (similar to my approach on that other audio equivalent of wine-snobbery, speaker cables). What you don't see are two big aluminum heat sinks, which will fill much of the space on either side of the power supply. The diode bridges and amps will be connected to these. I have circuits both for a Class A amp, which will need every inch of the cooling, and a class D amp, for which the heat sinks will be an unnecessary overkill. But they came with the box and I have the space. I know that those of us who use projection TV at home are a tiny niche (tiny but happy!). For those who are interested, this guy puts out the best projector reviews I have seen. I am a big fan of the Epson line and yet again, the Epson (this time the 5010) wins in the mid-price range. I have the previous version, and it is the ideal projector for someone like me stuck with a bad room, meaning a non-dedicated home theater where in the daytime there is a lot of ambient light. Very bright for daytime sports, great blacks and color in movie mode when the room is dark. I have not tried the new wireless HDMI built into the "e" models of these new Epsons, but it should be a huge boon for projector fans. Running signal wire to ceiling mounted projectors has always been a pain, especially as the standard has shifted about three times since I first wired my house (composite to S-Video to component to HDMI). But HDMI is particularly hard, since the HDMI standard was never really spec'd for long runs of wire. It is very dicey getting a reliable high-frequency signal (ie that needed for 1080p 3D) through HDMI cables that may be more than 25 feet long. I have written before that I have a large movie collection ripped to a 16TB raid. In the past I have used SageTV to stream, but Sage was bought out by Google almost a year ago and has gone totally dark since then. 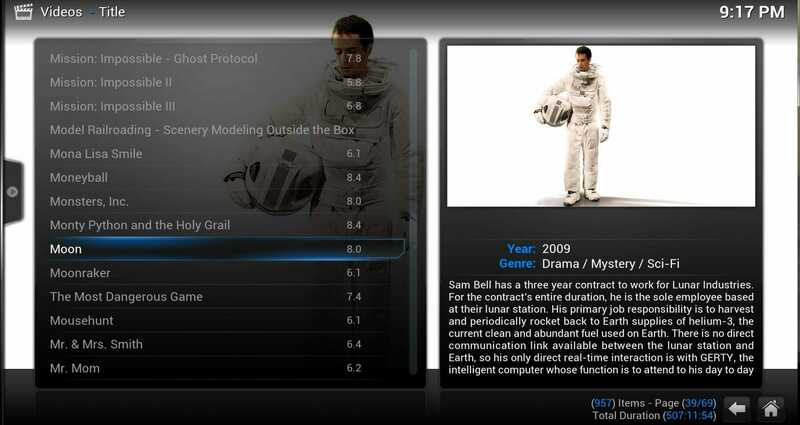 So I switched to XBMC, which given I am not messing around with PC-based DVR, actually turns out to be a better solution from a software standpoint. I will post on my progress next week. The problem is getting a low cost streaming box to run it, like Sage had with the HD200 and HD300. Here is the hottest product in the geeky build-your-own end of home theater, the Raspberry Pi. A tiny computer board that apparently will run XBMC (I presume the Linux version) and stream at a full 1080P and costs about $35. Right now, XBMC users are using either dedicated PC's or hacked AppleTV boxes. I have one of each on the work bench -- the dedicated PC is expensive and the AppleTV box based on the old ATV2 won't run 1080p. 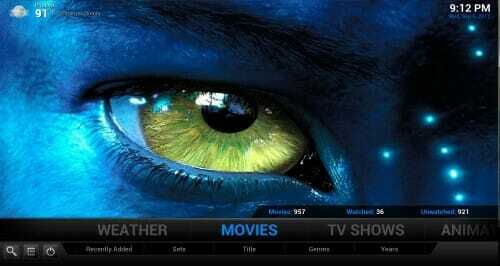 The new ATV3 will run 1080p but no one has apparently rooted that yet, and besides it is still a lot more than $35. So I am on the waiting list for my Pi. I know some of you live in Phoenix. I am offering a deal to get rid of some B&W Nautilus 805 speakers that are in great shape. I really enjoyed my first foray into building speakers (the first ones were here, and were an L-C-R for the home theater). So I tried building a new pair. The home theater speakers are behind the projection screen (the big gray thing in the picture). The speakers definitely lose something behind the screen. Though it is no big deal on movies, for music I wanted speakers outside the screen. I needed something with high WAF (a term very common on audio discussion boards, it stands for wife acceptance factor) but that sounded good. In effect, I needed something relatively small that filled a big room. These are bipolar speakers, which does not mean they are good at playing Rage Against the Machine albums. It means they have two drivers, usually at 180 degrees from each other. The advantage if well designed can be more full, room-filling sound. These have the second driver mounted on top, rather than in back. The reason for this is that I knew they would be close to the wall, and bipoles with rear-mounted drivers need space I did not have. I built them roughly to this design, though I used MarkAudio Alpair 7.3 drivers instead of those in the design, and I moved the port to the front from the bottom. These are full range driver speakers. The driver actually runs from about 60-ish Hz to over 20,000 Hz and is pretty dang flat over that range. The advantage of this is we get rid of the electronic crossovers between the woofer, mid, and tweeter. Often the crossover frequencies sit right in the most sensitive range of the ear, as well as in vocal range, such that even small irregularities degrade the sound. Also, the sound is coming from a single point source, which sounds great, and the speaker is more efficient. The downside, of course, is that it is asking a lot of a driver to cover this wide range. These speakers sound amazing (I will spare you the audio review-speak that sound so eerily similar to wine-snob-speak). You would simply not believe the sound that comes out of these little drivers. The bass is pretty solid too, though I think I will add a subwoofer on the bottom. The bass reinforcement comes from the quarter-wavelength transmission line design, the theory of which is discussed in great depth here. You can find a lot of this sort of design in stores, as the tall thin tower look is aesthetically appealing, and has the fortunate side effect of working well for bass reinforcement (probably the number one role of any cabinet). I spent a lot of time in Mathcad on these. 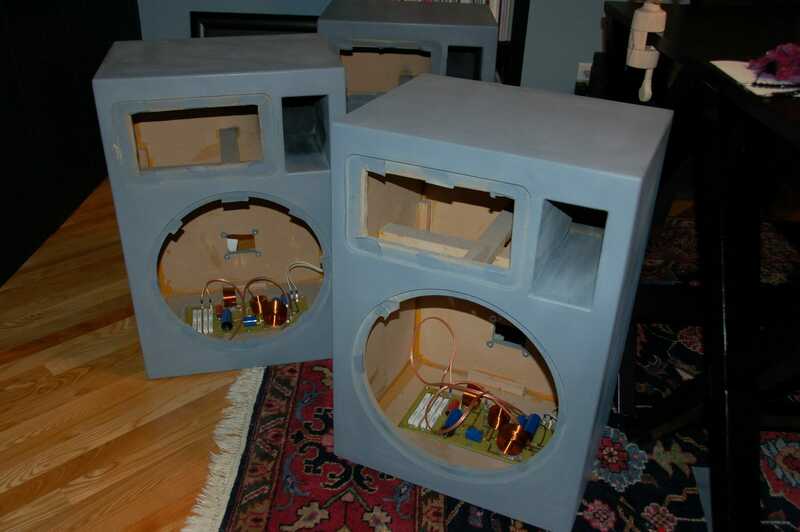 I am starting to reach my goal of eventually building speakers of my own design -- for these I modeled and then modified an existing design. The boxes are built out of 3/4-inch baltic birch plywood, again with all large saw cutting done by the lumber yard, while I did the rest at home. This is my first experience with veneer, which i in this case is black-dyed ash and it came out great, though I put the satin polyurethane coating on a bit too think and got them a bit glossier than I wanted. They are well braced on the inside and the back is removable to tune them with more or less fiber stuffing -- at first I only had a bit and the bass was too boomy, but adding more along the length of the speaker tightened the bass as well as the mids a bit. This was a very easy project, much easier than the first speakers I built. As I learned the first time, with router jibs, round holes are actually easier than square ones. If someone is looking for a great starter project, these speakers, with just one driver, would be my choice. Markaudio is a great driver manufacturer, not only because they are making what may be the best full-range drivers out there, but their proprietor spends a ton of time on the boards interacting with the DIY community to find out what they would like to see changed. I have decided to save the photo-essay of my speaker-building project until the project is finished and I can put it all in one long post. However, just as an update, I am really close to done. 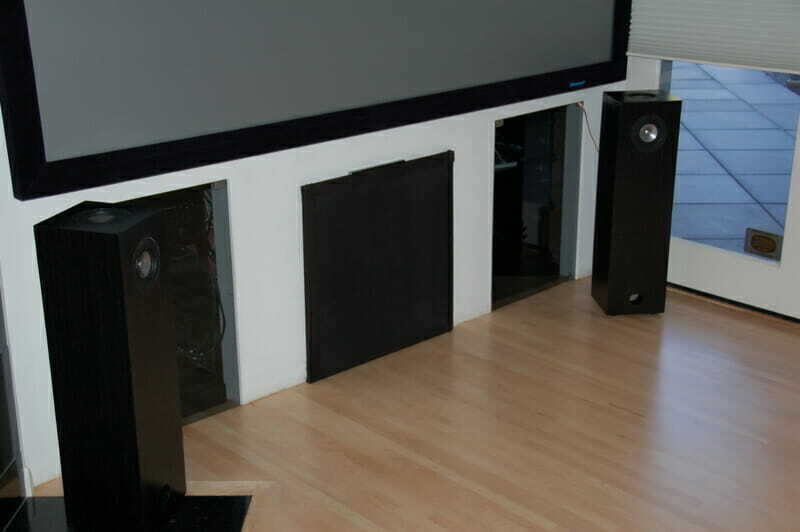 The three speakers (left, center, right) will go behind my accoustically-perforated projection screen. As you can see, the enclosures are complete and primed and the crossovers are complete and installed. The special paint I ordered arrived today so I can paint this weekend and install the drivers. The funny shape of the openings at top are due to my choice of drivers -- the tweeter will be a horn-style driver, an approach I wanted to try for home theater in a large room (movie theater speakers use the same technology). 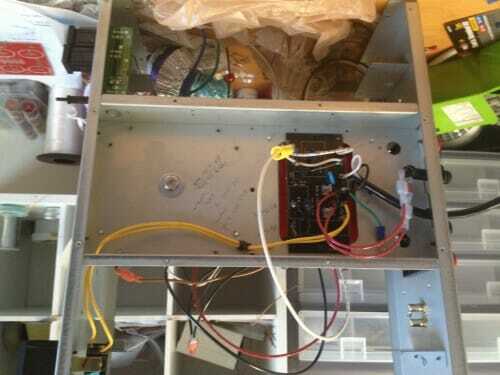 The cabinet is ported for bass response -- that is what the rectangular opening is in the upper right. These are based on a design by Pi speakers. Knock on wood but given my total and complete lack of carpentry skills and experience (think Anthony Michael Hall in the Breakfast Club, the geeky kid who fails shop), I am just thrilled with how they are coming out.